Last year we began talking about homework. The discussion is a difficult one for teachers to undertake. On one hand, we all had homework, didn’t we? We survived! On the other hand, homework can be an equity issue. I have written about how I don’t give as much homework as I used to. Yes, even in an AP class. My students are doing more in class because I am the expert in the room and can help them in the moment. This means I rarely lecture and, if I do, it only lasts 10 minutes or so. I want the students DOING more than merely listening or note-taking. I want them participating, writing, reading, thinking, discussing. My role is no longer just to dispense information. Instead, I act as a coach. I nudge the students. I guide them. And most importantly, I provide them with authentic activities. No more “fake” writing solely for the teacher. I want them writing for a wider audience and I want them to care about what they are writing. This is one way to make my content area, English, relevant to my students. So where does homework fit in? If I want my students to have access to help, I have to make sure they do a great deal in class. Not all students have parents who can help them at home. Also, I want students to be fully engaged with the task at hand. When they are home they most likely will have interruptions. Distractions can be caused because of the home environment or because of their phones and open tabs. My classroom is an environment I have control over and I make the students comfortable so that they can be productive. Homework, really, becomes more of an extension, an extension of an assignment we started in class, further research, or extra practice. The assignment has a clear academic purpose and is not “busy work.” Rarely does homework count against them. Instead I use it to inform my teaching. Looking at and using homework in a different way has been difficult. It is hard to undo almost two decades of homework traditions in my own classroom. It is even harder to undo my idea of what homework should be based on what I experienced as a student. The change has been worth it, however. 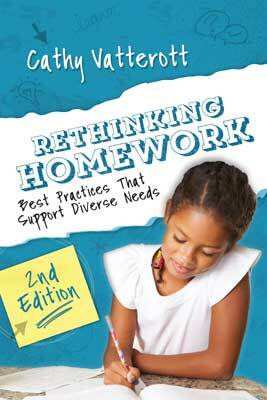 Have you been “rethinking homework?” If so, Rethinking Homework: Best Practices that Support Diverse Needs by Cathy Vatterott is a book you need to read. From the very beginning you will see homework differently. (See a sample of the book here!) Vatterott looks at the history of homework and its place in education over the past 100 years. Yup, 100 years. How much has our society changed in 100 years? How much has education, and specifically homework, changed? I bet you can guess the answer. After providing a brief look at the history, the author goes into the commonly held beliefs about homework, the equity issues, and research. She then moves into effective homework practices and why the old paradigm for both grading homework and assigning homework don’t work in context with the new family and with Common Core. She discusses support programs and provides materials, such as homework surveys, in the back of the book. A huge takeaway for me from this book was that we need to view homework as formative feedback. When we do so “grading becomes unnecessary for feedback” and “possibly even detrimental to the student’s motivation to learn” (Vatterott 135). This made so much sense to me. If a student is not doing homework, we need to investigate a bit more. Perhaps the student does not understand the concepts. Perhaps I poorly designed the activity. Perhaps a student cannot focus on homework after school because of other obligations or issues. Why are we punishing students with failing grades if there is a larger issue at hand? Working with an EL student last semester, he confided about serious family issues at home. He was also working until well after midnight on weeknights. He had become suicidal. Homework was simply not an option when he was barely surviving his day-to-day life. An AP student in my class never finished anything out of class. When I spoke to her about it, I learned that she was struggling with how to read the text and didn’t know what to annotate. She was embarrassed to admit it to her peers when they would talk about the text the next day so she said she didn’t finish the reading even though she had. When we use homework in a formative way, it opens up lines of communication with our students and allows us to then take the necessary steps to differentiate and tailor the learning for the students we currently have in our rooms at the moment. If you are rethinking homework, Vatterott’s book outlines the following elements: designing QUALITY homework tasks (YES!!! ); differentiating homework tasks; deemphasizing grading of homework; improving homework completion; implementing homework support programs. Pick up a copy, read it with a colleague, discuss it with others. Together we can look at innovative ways to reimagine homework.